According to the World Health Organization, malaria is one of the most serious public health problems globally. Malaria is a parasitic disease caused by protozoa of the genus Plasmodium, which are predominant in tropical and subtropical regions. Currently, the number of safe medications for this disease is limited, mainly due to the development of drug resistance. Combination therapy is recommended by the World Health Organization to either prevent or to delay the onset of resistance. Implementing projects in the medicinal chemistry area, which include organic chemistry and biological activity investigations, is essential for the discovery of new drugs. 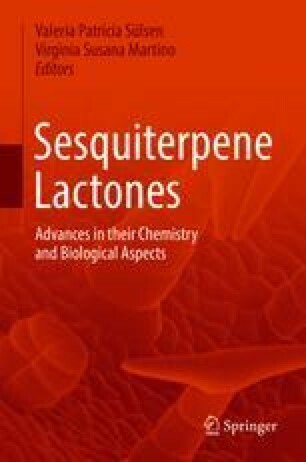 Sesquiterpene lactones have been demonstrated to be important antimalarial drugs. Artemisinin and its derivatives are some of the most widely used sesquiterpene lactone drugs and contain an endoperoxide bridge. Due to their antimalarial properties, several new sesquiterpene lactones have been tested in clinical trials and are being studied as a new class of antimalarial agents. The activity of sesquiterpene lactones is primarily attributed to the α-methylene-γ-lactone group that is present in their structure. Molecular hybridization is a strategy that is employed by medicinal chemists for the discovery of new drugs which involves combining pharmacophore fragments with a single hybrid molecule. Several synthetic hybrid sesquiterpene lactones have shown significant antiplasmodial activity. The aim of this work is to review antiplasmodial agents featuring a sesquiterpene lactone scaffold. Particularly, the sesquiterpene lactones that are currently being used or those that are still in the development process as well as those from natural or semisynthetic origins are highlighted.